Our Concept - KRASS e.V. The KRASS e.V. 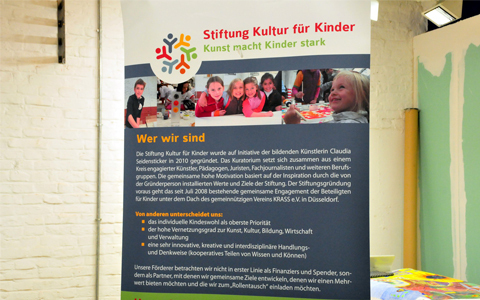 (The KRASS Association) is a program of the Culture for Children Foundation. The administrative head office is KRASS e.V. (Düsseldorf). It was founded in Düsseldorf on October 16, 2009. Since KRASS e.V. is recognized as an NGO, just like the Culture for Children Foundation, all of our activities are nonprofit. In addition to its headquarters, the KRASS association is present throughout locations worldwide. We call these locations “KRASS on location”. The goals of “KRASS on location” are the same as for the headquarters in Düsseldorf. Our vision is the main guideline for all activities that are being conducted under the name of KRASS. It is the focus of the association at large. That is why the vision is of central importance and is always considered before all other matters. The association statute describes the organization and co-determination of the association’s members. The statute is the legitimization of all our activities. It is valid for each member. The manual is the basis for the association’s actions. Within the manual, standards are defined, that professionalize and simplify all internal cooperations of KRASS‘s locations. The manual covers all areas concerning the association: organization, communication, accounting, funding, human resources, project management, and law, etc.The contract defines the cooperation in between the head office KRASSe.V. (Düsseldorf), and all other locations (KRASS on location). The components of the contract are mandatory components for all KRASS locations. This ensures a correct realization of the project.